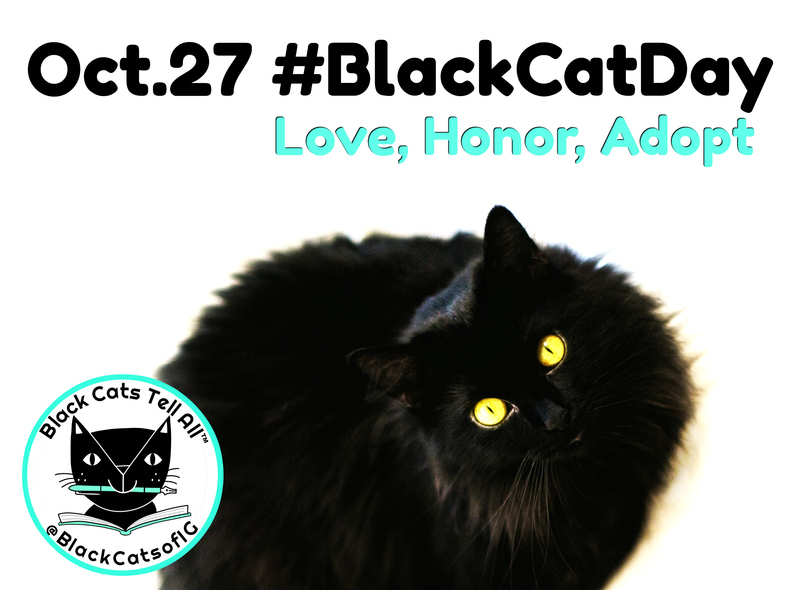 Our Spotlight shines brightly On National Black Cat Day today, October 27. It feels like the holiday has been around forever but it’s only been seven years. Founded by Cats Protection, the UK’s leading feline welfare charity it’s grown and changed over the years. 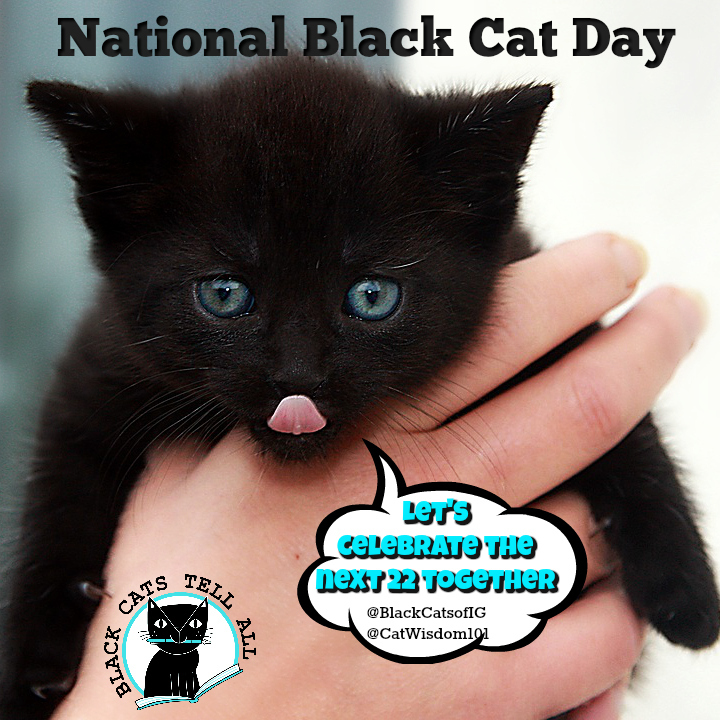 Read about the history of National Black Cat Day. It’s more of a U.K. thing but thanks to social media, it’s spreading across the pond. It’s my hope that if all work together, it will be an international force for good. 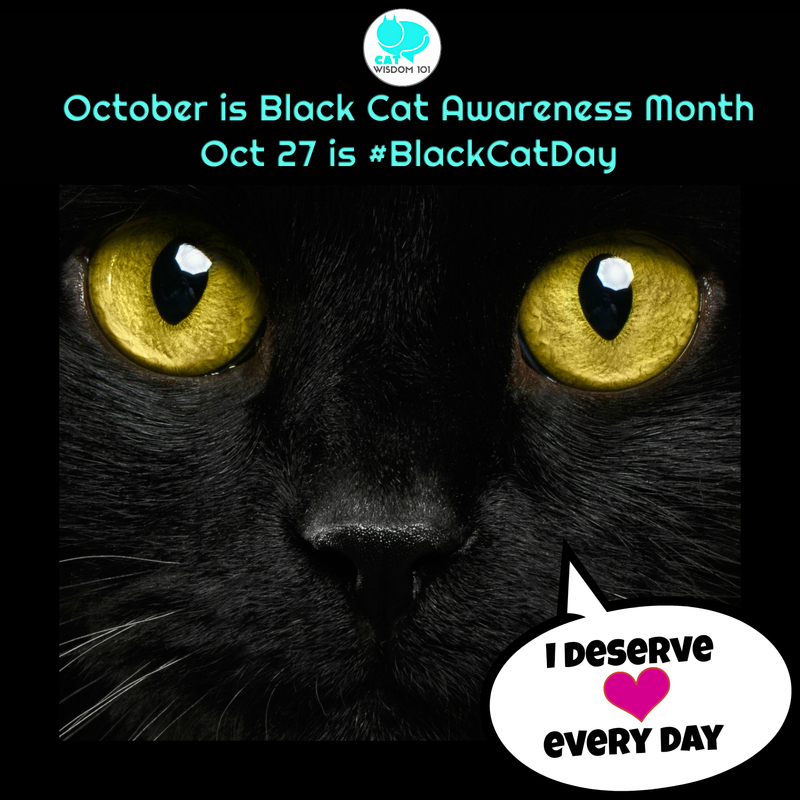 I can only dream that in seven years our Black Cat Awareness Month will radically change negative perceptions about black cats and raise their adoption rates. What can I say, I’m a dreamer who doesn’t sleep. This is not at all what I expected to post. There were images I wanted to upload but there was one obstacle after another. Finally, I gave up and began Plan B. This post is dedicated to my mother Kaija who began using her middle name Kersti about 10 years. She never explained why and it’s one of a million questions I’ll never get answered. It’s her birthday today and it’s her last one. 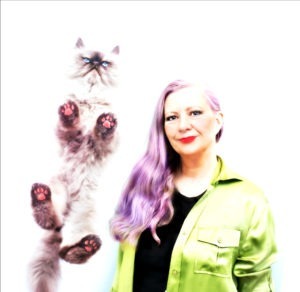 She’s a feisty Scorpio who has lived at least nine lives and adored cats. She gave me my first black kitten as toddler and I gave her a Scorpio tortie 2o years ago. I never thought I’d wish her happy birthday with a nurse holding a phone to her ear in a palliative care ward. I never thought someone who likes to talk as much as I do could be silenced, mute from pneumonia. It all happened so quickly. My brother said with the disbelief, “She was fine last week, then ICU.” The nurse said she was awake and comfortable and didn’t need the morphine drip tonight. My mother who loved pills and cigarettes, sherry and pot on occasion would disagree. I will never see her again, not because my green card expired and I can’t leave the country for months but I want to remember her as she was, larger than life. Beautiful and tragically flawed, meddlesome and the source of many of my gifts including intuition. I’ll post some pics when the tech gods are in agreement. Needless to say, I’m not in the mood promote my book and do the relentless marketing needed. I’ll do what I can and hope it has legs to create a life of its own. You all know what you can do. I need everything, Chocolate would be nice too. To celebrate I’m sharing a variety of shareable photos, quotes and graphics I created. Pick your favorite and share. 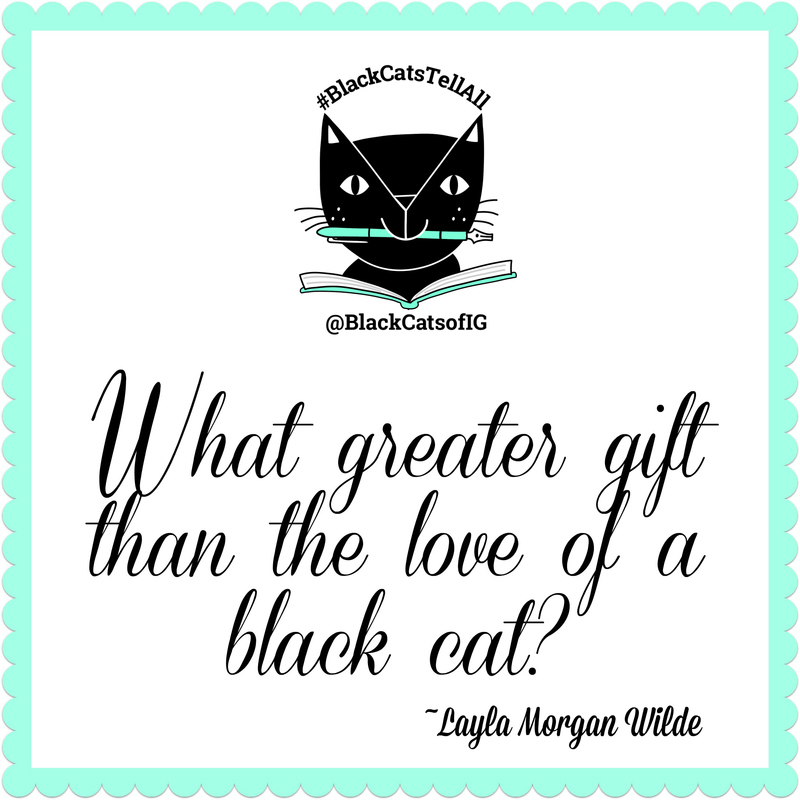 If you have a black cat, give them a special treat and if you don’t have a black cat, share the love and buy our book and enjoy over 100 black cats. Barnes & Noble still has the best price but Amazon is running a discount. I was asked in an interview recently why I wanted to write Black Cats Tell All and take on the black cat cause. There were several reasons but the turning point came while volunteering a shelter in 2014. 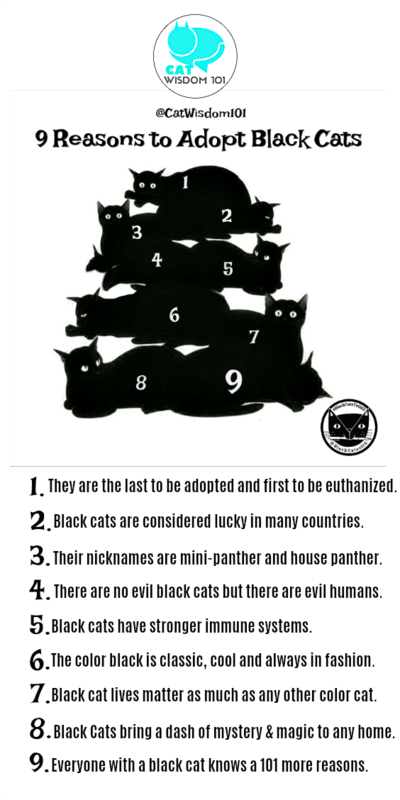 I’d blogged about black cat awareness for years, knew about the low rate of adoption but there is nothing like seeing statistics come to life. Time after time, black cats were passed over for no logical reason. No one had ever said that to me, to my face with such venom. I felt as stunned as if she’d slapped me. Something snapped in me and I left the room without a word. The more I thought about superstition or prejudice as the reason, I began to advocate more actively. I had to. The slap woke me up to take action. This is an adoption graphic I made when the sunflowers came out in August and never got around to posting. Better late than never which applies to most things. Thank you for being here. I sorry if I haven’t visited your blog, returned emails and forgot who knows what. Since we have another big holiday Sunday and the icing on the October cake, Halloween, I’ll see you soon, I hope. Black Cats are adorable. To be honest, I would like to add one black cat to the 6 cats i have but I will save that for a later time, when I get more space at home. I hope your Mom had a very special day with hugs and greetings from all who are now surrounding her with loving care. So sorry that you are not able to be with her, that is so hard. Much love from LAX. 2 copies of Black Cats Tell All are travelling to Atlanta with me. I’ll buy more from B&N. Much housepanther love, purrayers and pawsitive thoughts to you. You got copies already??? Awesome and thank you! We’re so sorry to hear about your mom, Layla. Please know that she and you are in our hearts and thoughts. We are looking forward to reading your book. Thank you for your passionate advocacy for housepanthers everywhere (including our Gracie and your beloved Clyde). Hugs. Many purrs of thanks. Can you believe Clyde’s first gotcha day is coming up! Sorry to hear about your Mother, we love black cats here and can’t imagine life without them. Yin is PURE LOVE and Mommy reports that all the black cats she has had throughout the years have been very loving. (shh don’t tell but black cats are Mommy’s favorites). Your secret is safe with me. And thank you! I don’t understand how they are the least likely to be adopted. I myself adopted a 3-month-old black kitten. It was very sad to see that there was mostly black cats there. I knew he was the purrfect one because when I went to his cage he seemed outgoing, friendly, and playful, and when we held him he would purr a storm and give the ‘I love you’ slow blink. He was very adventurous, too and responded well with the other shelter kitties 🙂 His name is Shadow. Thank you for adopting Shadow. He was lucky. 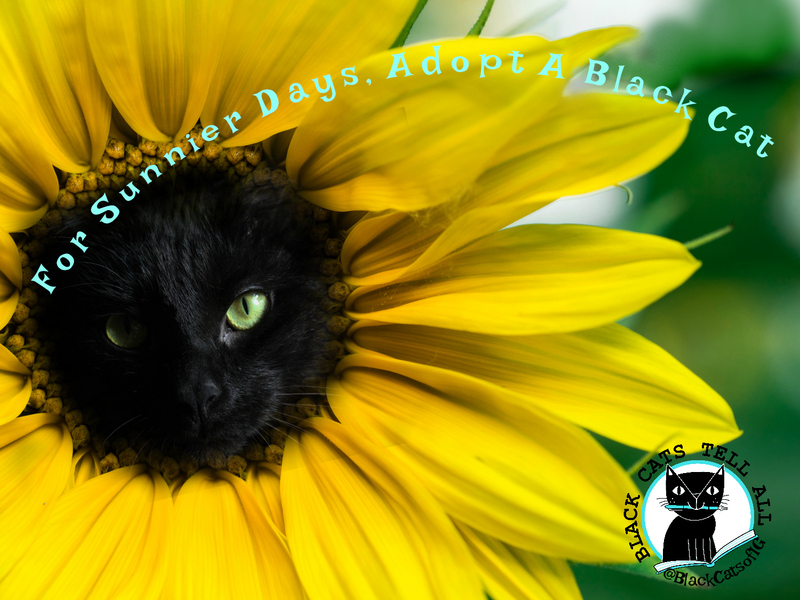 The less outgoing black cats are even less likely to be adopted. Andrea, so nice to see you here and thank you! I’m so sorry about your mother. She sounds like a really interesting person, and someone my human would have liked a whole bunch! Purrs to you. So sorry to hear about your Mom. She sounds like a fantastic lady. I bought your book yesterday and will definitely post about it. Sending Birthday wishes to you Mum and thoughts of peace. Love to you dear Layla. Sending hugs and purrs to your mother, and your family. We are sorry about your mom, Miss Layla. We send you and your family a ton of purrs…. I am sorry to hear about your mum but send her birthday wishes. I wish I could give you some of the delicious chocolate we have been eating tonight. We have just come back from 15 days in Ireland and visited Ballinskelligs chocolate factory, a family run business in a stunning location on the Ring of Kerry. LOVE Layla,we send love to you. Hugs, we send hugs to you. Purrs, we send purrs to you. prayers, we send prayers to you. Peace, we send peace to you. The circle of life, fast,slow,happy, sad, calm, manic but always relentlessly marching around and around…..
Oh Layla, I’m so sorry to hear about your mom but definitely Happy Birthday to her. Boy, when it rains it pours. Thinking of you today.